1W. Lu and Z. Zhu (e-mail: zqzhu@ieee.org) are with the School of Information Science and Technology, University of Science and Technology of China, Hefei, Anhui 230027, China. 2W. Lu is also a visiting Ph.D. student at the University of California, Davis, Davis, California 95616, USA. 3B. Mukherjee is with the Department of Computer Science, University of California, Davis, Davis, California 95616, USA. 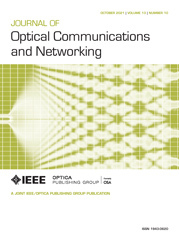 This paper studies how to optimize deadline-driven bulk-data transfer to recycle spectrum fragments in elastic optical networks (EONs). We first formulate a mixed integer linear program (MILP) for offline optimization with one of two objectives: 1) maximize the average data-transfer percentage of data-oriented requests (DO-Rs), or 2) minimize the incompletable data transfers among the DO-Rs. Then, we propose two dynamic provisioning algorithms. One addresses the first objective by setting a threshold on the minimum transferred data per time slot, and the other considers both admission control and blocking-aware routing and spectrum allocation to optimize the service provisioning according to the second objective. Simulation results indicate that the proposed algorithms can effectively optimize the DO-Rs’ data transfers according to their objectives, revitalize the spectrum fragments, and improve the network spectrum utilization significantly.